Worker safety is an ongoing concern for the workers, the organization for which they work, and the companies that they perform work for…in other words, safety is everyone’s concern. 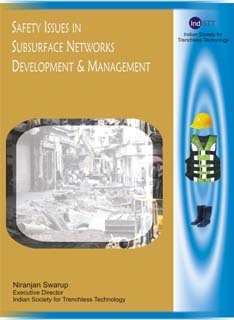 Subsurface networks are one of the major necessity of the modern day living. The development process entails several hazards and their containment is what the need of the day. Further any malfunctioning utility network will create situations where the natural or created habitat may be rendered completely useless, a non-performing habitat. It again is necessary that they be rehabilitated or renewed. Both these again require actions full of hazards. This safety guideline has been prepared to assist the subsurface developing and managing industry in understanding the basic issues related to safety in their course of actions. It contains suggested safety practices and is not intended to establish standard industry requirements. This guideline is to assist workers associated with the subsurface network development & management activities to work safely and with close adherence to job requirements. Many aspects of development and management safety can only be accomplished by using every worker’s intelligence, careful attention to detail, and common sense. The vision of this guideline is to provide a brief summary of some of the best available safety knowledge in the industry. By adopting these proven practices, you can reduce the potential for personal injury and safety related losses. Our goal is to augment, not replace, site-specific safety plans. This book is a collection of safety practices and lessons learned and compiled by knowledgeable remediation drilling and safety, health, and environmental professionals. As our industries progress and learn new techniques, we hope to keep this guideline evergreen by revising it periodically to evolve with new practices and technology so that it reflects future subsurface network development and management practices. The book finishes with the suggestions about emergency preparedness which is indicative only. Please note that with the alteration of site specific requirements there will be more items in each of these sections and the details in this book are never expected to be exhaustive. The reader should never stop thinking and identifying, quantifying, and devising related control measures for more site specific Hazards. Happy development and management! Please take care and keep everyone safe around you.